The ability to engrave or personalize a product you purchase is one way to make an item truly your own. Whether you’re looking to purchase a customized pocket knife as a treat to yourself or as a gift for a friend or family member, it can be tricky to find a trustworthy provider of engraving services. We’ve compiled this list to help you find the best stores and craftsmen who provide affordable pocket knife customization. Without a doubt the best place to go for an engraved pocket knife is Knife Depot. They have an incredibly large selection of pocket knives that can be engraved for a personalized touch, and they have top notch service to back up their awesome products. Be sure to check them out! Another established provider of engraving services is Things Remembered, a national chain specializing in customizable gifts for men and women of all ages. A variety of pocket knives are available for purchase both in stores and on the brand’s website. A number of these pocket knives may be engraved at a small fee, with some options, such as this classic silver pocket knife coming with a free custom engraving option for only $20. The knives offered on the Things Remembered site are some of the most affordable custom pocket knives available on the web, with a few simple options available. If you’ve already found the perfect pocket knife elsewhere, you can have it evaluated at your local Things Remembered store, where it can be engraved with a message of your choice. Whether you’re looking to buy a new pocket knife to engrave or are looking to personalize a family heirloom, Things Remembered is a trustworthy provider of engraving services. If you’re looking for a wide selection to choose from, consider checking out the Knife Depot’s huge selection of pocket knives. The online knife provider has established itself as a leader in the knife engraving industry, providing customers with over 10,000 different knives to choose from, all of which may be engraved. Whether you’re looking for a single, double, or triple-bladed knife, the Knife Depot has the pocket knife you’re looking for. The online store also offers a wide array of Swiss Army knives. Any Knife Depot pocket knife can be engraved on the blade, a particularly stylish way of customizing your purchase. If you’re looking for a traditional pocket knife on a budget, consider checking out the Imperial Old Timer Pocket Knife, available for under $15. The Smith & Wesson Military & Police Pocket Knife is an incredibly cool pocket knife, offering a super-sharp blade as well as an awesome assisted-opening mechanism for just $40. These stunning pocket knives and many more are available for purchase on the Knife Depot’s website. All blades can be engraved with up to 30 characters, and will arrive within roughly two weeks of purchase. The site doesn’t charge per-character for their engraving services, either, so you can customize to your heart’s desire. If you choose to get your pocket knife engraved through the Knife Depot, you surely won’t regret it. Another top provider of engraved pocket knives is the Oregon Knife Shop. The site has a huge selection of knives to choose from, and provides free engraving services on eight of its most popular knives, all of which cost less than $35. Three Swiss Army knives are among the knives available to be engraved for free. For a limited time you can even get the Kershaw 3/4 Ton pocket knife with free engraving for only $20! If you’re looking for an awesome knife and want to customize it for free, definitely check out the Oregon Knife Shop. 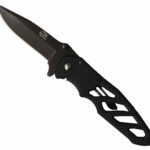 The online store offers a variety of other pocket knives as well, all of which can be engraved for a small fee. If you’re not satisfied, the site even offers a 30-day unconditional money-back guarantee. The Oregon Knife Shop is hands-down one of the best providers of pocket knife engraving on the web. If you’re looking for a more uniquely engraved pocket knife, consider checking out the pocket knife engraving available on Etsy. Many craftsmen on the site sell customizable pocket knives. A number of the knives offered on Etsy have classic wooden handles which can be engraved with words of your choosing. Though the prices on Etsy vary widely, most craftsmen offer engraved pocket knives for prices similar to that of other retailers and web providers. If you’re looking for a particularly special way to engrave a pocket knife, skim through the engraving services offered on Etsy. 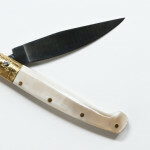 With over 3,000 craftsmen selling personalized pocket knives, Etsy is the top way to connect with small businesses offering pocket knife personalization. Though there are many stores and websites offering custom engraving services, these providers stand out as some of the very best. Whether you’re looking to personalize a pocket knife for a recent graduate or are looking to treat your groomsmen to a set of quality blades, these providers are sure to offer the services that will meet your needs. Few gifts are as precious as those that come from the heart. Consider personalizing a gift for a loved one today.